Foreign experts have urged the HCMC government to cut red tape and enhance transparency to create a more conducive business environment, reported the local media. Speaking at a conference with foreign experts and investors on Saturday, Nguyen Thien Nhan, Secretary of the HCMC Party Committee, spoke highly of the foreign direct investment (FDI) sector in the city as it is a driving force for the city's growth. Nhan cited statistics as saying that foreign investors have so far this year pledged a total of US$1.55 billion in the city, rising 20.4% from a year earlier, and making up around 23% of the country’s FDI approvals. Technological advancement and globalization have required the city to reform its governance to create a favorable environment for business operations and innovation, according to the city leader. Amanda Rasmussen, chairwoman of the American Chamber of Commerce in Vietnam, said the city has made substantial progress in customs clearance. However, frequent post-customs clearance checks have made life hard for investors while regular tax inspections place a burden on foreign enterprises. Therefore, she urged the city to create a level playing field for investors, and deal with red tape and corruption. Tomaso Andreatta, vice chairman of the European Chamber of Commerce in Vietnam, said that foreign investors have shown strong interest in the process of restructuring State-owned enterprises, support for small- and medium-sized enterprises, and tax policy and tax audit issues. To fuel more growth and attract more foreign investment, Andreatta suggested the local government fast-track the execution of infrastructure projects, including the expansion of the Tan Son Nhat International Airport and the completion of the city’s first metro line, take effective flood control measures, and improve the public transit system. He added that European investors also pay special attention to environmental issues, and the city should set up an agency to oversee the discharge of wastewater in industrial parks and urge the central Government to issue policies for air quality improment and public transport development. Michele D'Ercole, president of the Italian Chamber of Commerce in Vietnam, said that the city government should speed up administrative reforms, enhance transparency in the business and investment environment, and protect intellectual property rights. City authorities should pay further attention to human resource development due to the city’s lack of skilled labor, D'Ercole noted. Also, the city should zone high-tech parks for technology firms, and support those involved in the city’s key projects. More Spanish companies are setting up shop in Vietnam. In the past they cared about low-cost labor but now their investment decisions are based on growth prospects, macroeconomic stability and clear policy on global cooperation, according to Carlos Domínguez-Agulleiro, deputy head of the Economic and Commercial Office of Spain in HCMC. He also pointed out hindrances to investment activity and potential projects, including a lack of transparency in procedures, which causes unnecessary delays and uncertainties. Additionally, delayed traffic infrastructure projects have affected many other investment projects, and the lack of infrastructure has significantly eroded the competitiveness of HCMC in particular and Vietnam in general. 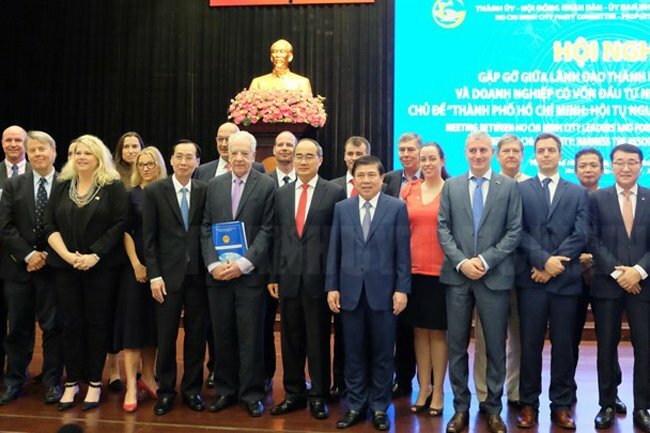 The city’s chairman, Nguyen Thanh Phong, took note of the recommendations by the foreign business community, saying the city always considers the FDI sector an integral part of its economy. He said the city has more than 8,000 FDI projects with total registered capital of US$45 billion. With an average US$20 billion in annual export revenue, the FDI sector accounts for 58.7% of the city’s total exports. The sector employs 670,000 workers and creates indirect employment for millions of others. Phong pledged that the city will develop a more favorable and competitive investment environment in line with international standards and commitments in the free trade agreements which Vietnam has signed.